Do I Really Have to Rake My Leaves? Woman in red boots raking Fall leaves with rake. It’s been an unusually warm, wet summer here in Northern Virginia, but at some point, we all know those leaves are going to fall. Fall leaves can feel like a big landscaping nuisance, but they don’t have to be. You can decide to rake them and take them or (with the right equipment) leave them alone. Let’s take a look at some of the best leaf management options. Why Do We Remove Leaves? Fall leaves can look pretty for a while, but if they’re left on the ground, they can form a thick layer and block needed sunlight from reaching your lawn. They can also trap moisture, leading to potential disease, according to the Virginia Cooperative Extension. To successfully manage leaves, you have three options: rake and remove, rake and compost or mulch them back into your lawn. 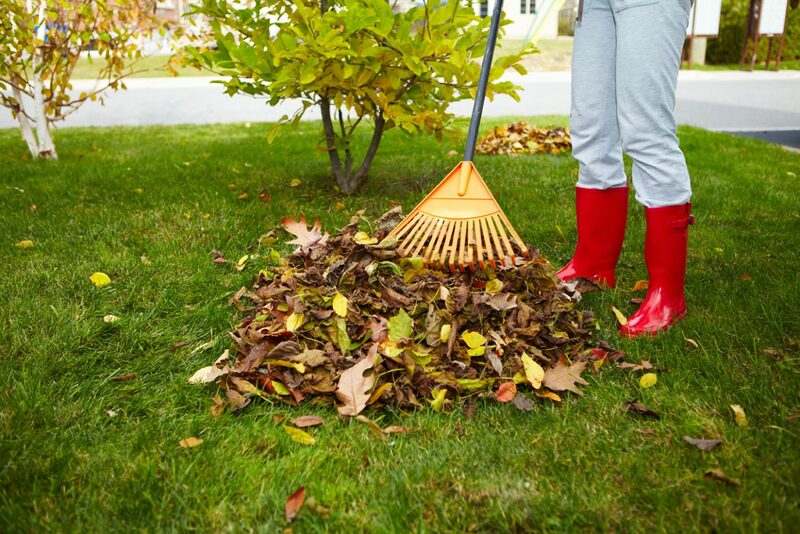 The old standby for leaf management is to rake, bag and remove (or speed up the process with a leaf blower). This tends to be more labor intensive but does give your fall lawn a neat appearance. However, leaf disposal options vary widely in Loudoun. For example, the Town of Leesburg offers bulk leaf pickup throughout the fall in specially marked yard waste trash cans or brown paper yard waste bags. However, many residents of unincorporated areas don’t have a lot of options beyond taking leaves to the county landfill for a fee. Raking leaves and composting them for use elsewhere in the yard is gaining traction is an environmentally friendly and low-cost landscaping option. This involves raking and piling leaves so that they can be turned into nutrient-rich compost. According to the Virginia Department of Conservation and Recreation, there are several ways to compost leaves, grass clippings and other natural yard waste. You can build a wooden or wire enclosure, buy a mounted rotating composter or simply create a compost pile. Composted leaves are a favorite among gardeners because they help generate beneficial microbes like nitrogen (fresh leaves) and carbon (dry leaves) to nourish the soil in your garden or other areas. Mulching during the winter can help regulate soil moisture, protect plant roots and avoid erosion. Composted leaves also attract earthworms, which help further break down and nourish the soil. VADCR recommends adding an occasional layer of soil and lime to your compost pile to help with the decomposition process. Just as recycling grass clipping reduces waste and helps enrich the soil, mulching leaves directly into your lawn is an environmentally friendly option. And guess what–it doesn’t involve a rake. Shredding your leaves with a regular lawn mower is often doable, but it certainly helps to have a mulching mower for best results. Mulching mowers (which can also be used to recycle grass clippings) have superfine blades that thoroughly break down organic matter into fine pieces so it can be left on your lawn without building up and blocking sunlight or holding in moisture. The cooperative extension reports that leaf mulch can reduce crabgrass and dandelions, and this also means no raking, which is a big plus for some homeowners. However, if you have a big leaf build up all at once, you may need to do some removal before direct mulching. At Epling, we love to follow our clients throughout the seasons, from landscaping in the spring to summer mowing to fall leaf management. Our goal is to keep your lawn healthy and attractive all year long and to ease the transition from one season to the next, while keeping things as environmentally friendly as possible. Our Total Landscape Program and Complete Lawn Care Program are excellent options to explore for comprehensive year-round care. We have the equipment and expertise to do the job the way you want in an efficient and cost-effective way. Epling helps keep your lawn and landscapes healthy, ready for winter and beyond.